I got my flowers and veggies into the garden. That's about all that makes me smile that's outside. Rain, rain and more rain is what we have so I'm looking inside right now for the smiles. 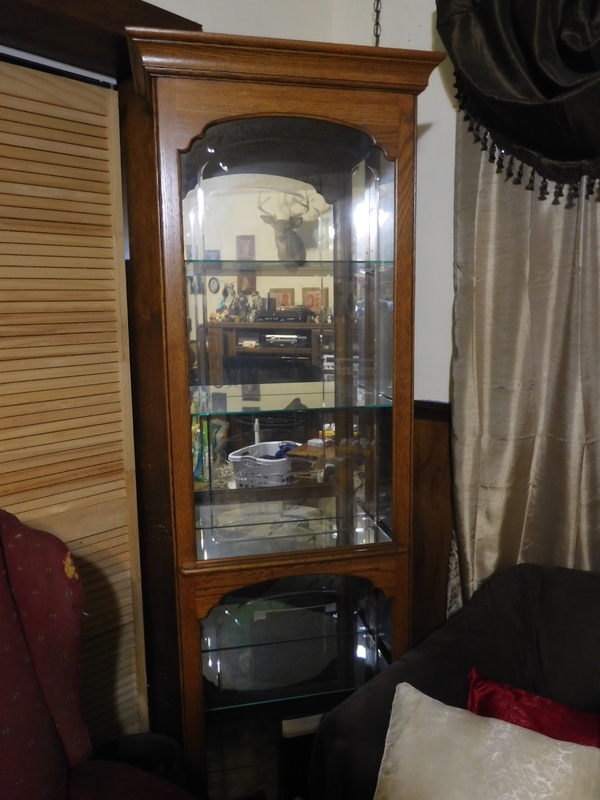 That would be the new curio cabinet that I inherited from mom. She had one that wouldn't fit in her room at the home so we brought it back with us from Atlanta. It will be the new home for my ever expanding owl collection. I should be able to get a few more out of boxes. I can't wait to fill it. Plan to fill it this weekend. Another thing to make you smile! Yes, it seems like I've wanted one of these for the longest time. I had one in my Amazon Wishlist but this one is so much nicer. Can't believe we got it home in one piece. Now I just need time to fill it. I'd love to see your owl collection in that beautiful cabinet. Beautiful! Can’t wait to see those owls! Your owl collection will have a gorgeous new home! Yes, it will when I get to it. Glad to hear from you. I was hoping you weren't near the fires. Since we moved out of Sonoma County and up to Sacramento back in March, the fires aren't near us. My sister is kind of close to the Anaheim fire but so far they're ok, too. I hope she stays safe. They keep saying that it's going to get worse before it gets better. That's scary. I'm really looking forward to seeing the owls in their new home!